Aikido is a Japanese martial art that is very different from any other. Unlike other arts that focus on aggressive blows, Aikido is a purely defensive art. Practitioners of Aikido use attackers’ own energy against them. 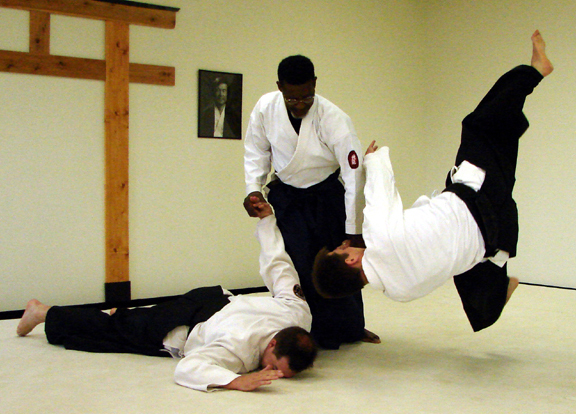 Kokikai Aikido emphasizes using minimum effort for maximum effect. It is not a competitive sport. Aikido is designed for people of all ages. There are practitioners as young as 7 and as old as 75. Whether you are young or old, male or female, you can benefit from what Aikido has to offer. Join us. Gain practical experience that translates into success in your everyday life. The Wilmington Aikido dojo is a member of Aikido Kokikai International, founded by Shuji Maruyama Sensei. Learn more about Kokikai here. Read a short biography of Sensei Berry here.